Today was a hectic day. I looked up from my desk after furiously working through the afternoon and it was already 4 pm . Where did the time go? Yikes, I needed to get dinner cookin’ before I headed out for 5:30 boot camp. Enchiladas it was! 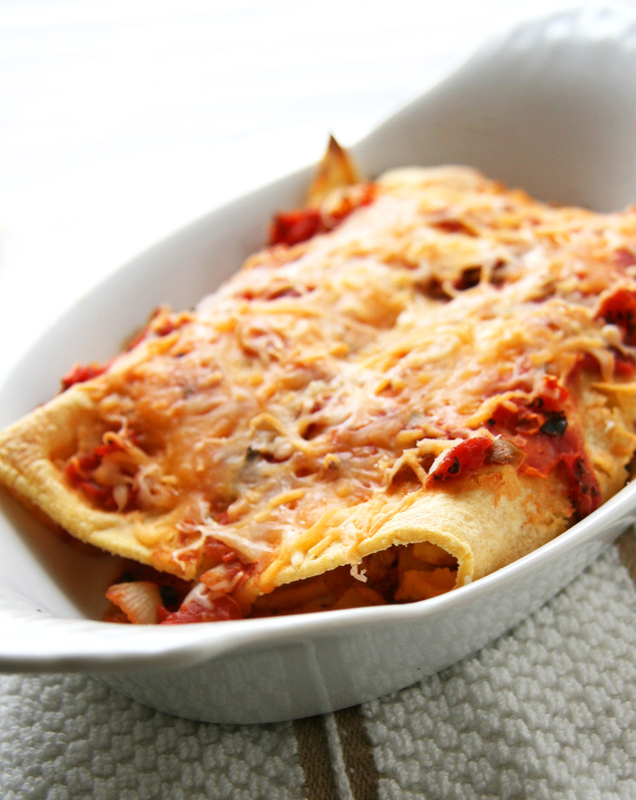 Enchiladas are one of our go-to weeknight meals, and usually make it into our weekly rotation. The variations and possibilities are endless! Chicken, beef, vegetarian, seafood – it’s all good in my eyes. Since corn tortillas are naturally gluten-free* and aren’t a “funky substitute”, this pleases both Chris and I. Plus, when you are cooking for two, it makes for great leftovers that I look forward to for lunch. This dish can be assembly a day ahead, making dinner a snap after a long day at work. It’s a complete meal with protein, carbs and lots of good veggies but I usually serve these with black beans or a green salad on the side. This recipe could easily be made into a vegetarian dish by leaving out the meat completely or substituting it with a can of black beans. 1. Preheat oven to 350F. Lightly grease the bottom of a 13×9 baking dish. 2. Heat oil in a large skillet over medium-high heat. Add chicken and onion until thoroughly cooked (onion is translucent and chicken is no longer pink), stirring occasionally. 3. Add squash and bell peppers and cook for additional five minutes, stirring occasionally. While veggies are cooking in skillet, mix water and taco seasoning in a small bowl. Whisk until mixture is well combined. 4. Add seasoning mixture to skillet and simmer until sauce thickens and most of liquid is absorbed. 5. Remove from heat and mix in cilantro, 1/3 cup shredded monterrey jack and 1/3 cup cheddar cheese. Stir to combine and set aside. 6. Pour a 1/3 cup of tomatoes (or salsa) into baking pan to coat the bottom. Microwave tortillas on high for 30 seconds. This softens them and makes them more pliable. 7. Spoon about 1/4 cup filling into each tortilla and fold over , then place into dish with seam side down. Top with remaining canned tomatoes (or salsa/sauce) and remaining cheese. 8. Bake uncovered in preheated oven for 15 minutes or until cheese melts. Garnish with toppings, if desired, and serve! 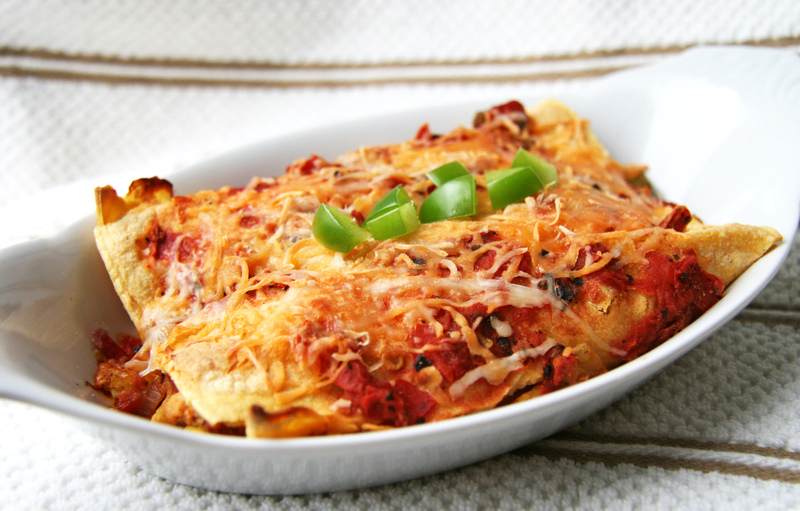 Recipe Notes: For a even quicker assembly, layer the filling, cheese, tortillas and tomato/sauce in a 9×9 pan to make an “Mexican Lasagna” or casserole. Bake as directed for 15 minutes or until cheese melts. *Check the labels on corn tortillas to ensure they are 100% masa harina and not the new 1/2 corn, 1/2 wheat flour “whole grain” version I’ve seen at the stores. Thank you for your kind words! I love your blog and all your recipes – I have my eye on your cookbook and I plan to order it soon!